Frank Arnold Jebbett was born in West Bridgford, Notts in 18942, the elder son of Edwin and Annie (née Walker) Jebbett. By 1901, the family, now including two children, had moved to live at 26 Hampden Street, Beeston, Nottinghamshire3. Edwin was a lace manufacturer, a principal with the firm of H Marshall & Co. which operated in Nottingham's Lace Market area4. Frank became a weekly boarder at Minster School in 1906, leaving when he was 15, and emigrated to Canada in March 19126. Frank, at just 17 years old, settled as a homestead farmer just North East of the town of Venn, in the Canadian province of Saskatchewan. He shared the homestead with brothers Harold and Fred Gadsby who had emigrated from Willingham Cambridgeshire. On the Canadian Census of 1916 all three described their nationality as Canadian7. At the outbreak of war between Great Britain and Germany in August 1914, Canada had only 3110 permanent troops but that Canada was automatically at war when Britain was at war was unquestioned. The Canadian government promptly sent a cable to England offering the services of Canadian troops. The offer was accepted a few days later and preparations were begun for the mobilisation of a division of approximately 20,000 men. The war was ultimately to claim the lives of over 64,000 young Canadians. Frank enlisted with the 184th Battalion, Canadian Expeditionary Force on 18th March 1916. Based in Winnipeg, Manitoba, this unit had began recruiting during the winter of 1915/16 in that city and in southern Manitoba. His regiment sailed on the Empress of Britain to England on the 31st October arriving in Liverpool on the 11th November 1916. The next month was spent in training at Shorncliffe on the coast of Kent prior to the onward journey to France in early December 1916. By then the 184th were incorporated into the Canadian 8th Battalion, Manitoba Regiment8. Private Jebbett was killed in the Battle of Arleux during the Arras Offensive on Saturday 28th April 1917. He was 22 years old. As his body was never identified, Private Jebbett is remembered on the Vimy Memorial which overlooks the Douai Plain from the highest point of Vimy Ridge, about eight kilometres northeast of Arras on the N17 towards Lens. 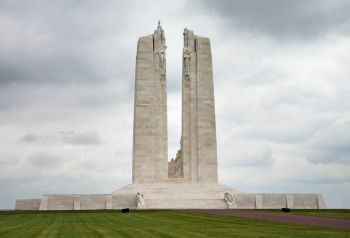 The highest point of the ridge was chosen after the war, as the site of the great memorial to all Canadians who served their country in battle during the First World War, and particularly to the 60,000 who gave their lives in France. It also bears the names of 11,000 Canadian servicemen who died in France - many of them in the fight for Vimy Ridge - who have no known grave.9. He was posthumously awarded the Victory Medal and the British Medal. In addition to his entry on the memorial of the St John the Baptist Church in Beeston, Frank is commemorated on two Southwell School memorials, the original in the former school premises (now the Minster visitor centre) and a replacement now in the school's premises on Nottingham Road, Southwell, opened in 200710. 2His birth was registered in Basford Registration District (of which West Bridgford was part) in Q2/1894 (Ref 7b 270). Edwin & Annie had married at Kirk Hallam on 3 August 1893 and both their sons were baptised there. It is about two miles from Ilkeston, where Annie was born and was living prior to her marriage. 31901 Census, Piece 3153 Folio 47 - Frank's only sibling, Arthur Cecil Jebbett (b. 1896) was also present. 41911 Census, Piece 20428 RD429 SD3 ED3 Sched 7. Neither son was present. Arthur Cecil, aged 14, was boarding at Southwell Grammar School. Frank had left for Canada on the 'Lake Manitoba' out of Liverpool and had arrived at St John, New Brunswick on 27 March 1911 (Canadian Passenger Lists - on ancestry.com). He then spent 8 months in Saskatchewan before returning to England and then emigrating in the following year. Edwin Jebbett is listed as a lace manufacturer with H Marshall & Co, with a residence at 26 Hampden Street, Beeston, in several directories in this period. 71916 Canada Census of Manitoba, Saskatchewan and Alberta - Saskatchewan, District 18 Humboldt, Sub District 7. 9This description of the Vimy Memorial is based on that included in the Commonwealth War Graves Commission website. 10Details and images of the memorials are at www.nottinghamshire.gov.uk/rollofhonour/WarMemorials/Details/156 and www.nottinghamshire.gov.uk/rollofhonour/WarMemorials/Details/157. Thanks to Andrew Adam for assistance with this memorial page.